Archivado en Agricultura | Comments Off on What are herbicides? 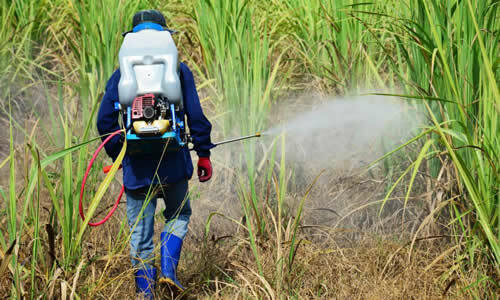 Herbicides are phytosanitary type chemicals commonly used to destroy unwanted plants in a particular planting. Depending on the type of herbicide or its classification, these work in the impediment of bad herbs growth. Most herbicides are developed from plant hormones. • Residuals: This herbicide type is poured directly on the bare soil to create a toxic layer that prevents the appearance and growth of bad herbs, eliminating them during germination. To get the soil to be kept free of bad herbs it is only necessary to apply this type of herbicide twice a year. Generally, the residual herbicides have no influence on the perennial species that are born of little bulbs, stolons or rhizomes. • Non-Residuals: When applied this herbicides type soon begin to degrade which makes them effective on the plants where this herbicide is applied. In addition, this type of substance varies according to the type of plant. • Selective: Selective herbicides work on land to eliminate unwanted herbs or a class of weeds in specific without damaging the crop. • Non-selective: They are capable of killing a wide variety of plant families. This is why non-selective herbicides are not only used in the field but are also used to eliminate vegetation on roads, industrial areas, and such. If it is to be applied on a crop, it is important to do it so, with total precaution not to damage these. • Systemic: They have a direct application on the plant, after being absorbed it is transported to other areas of the plant by means of the phloem, managing to do damage on the places where another herbicide did not take effect. • Contact: These herbicides are not transported through the phloem but only exerts their action on the plants where they fall. • Pre-emergence: These are applied before starting to cultivate, to avoid the appearance of bad herbs that could put the crop at risk. • Post-emergence: They are used after the emergency has occurred or after the crop has germinated. In addition to that, there are other types of herbicides that can be used during a pre-emergence or post emergency according to the type of crop, soil, climate and other influencing factors. The application of herbicides on crops tend to create a negative effect on bird populations; however, their impact is not always the same, so field research is often necessary to study their effects. Occasionally, laboratory investigations have overestimated the negative influence of herbicides due to their toxicity, sometimes predicting adverse drawbacks that are not appreciated in field conditions. Much of the negative effects of herbicides are due to the fact that their application causes a decrease in the number of plant species that provide shelter and food for the birds in the field. Even when low toxicity herbicides are applied, the decrease in plant biodiversity negatively influences birds. Using herbicides massively on neotropical agricultural areas is one of the reasons that these areas are not currently useful for wintering migratory birds. The application of substances such as pesticides or pesticides, synthetic fertilizers, among others, during the cultivation process, can have a very negative effect on the soil, modifying the fertility of this, resulting in the reduction or stopping the crop production.